Park County , Wyoming - U. S. A. On our second day we crossed the 11,800 pass between Meadow Creek (Wood River drainage) and the upper Greybull River (in the foreground and to the left in the photo). 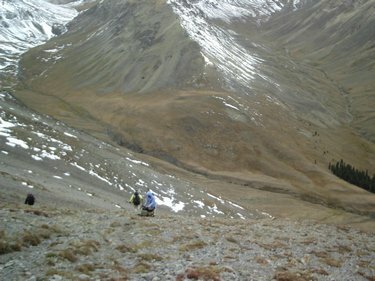 This accesses the ridge route to the highest point in the Absarokas, Francs Peak at 13,153 feet. Yellow Creek is to the right in the photo. 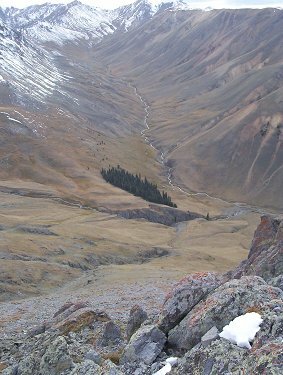 Yellow Ridge above Yellow Creek (to the right in the photo) is a primary route for elk migrating out of the upper Wind River drainage to their wintering grounds in the lower Greybull drainage. Upon our arrival at our campsite, we saw 30 or so elk in what could have been just the lead group of a larger elk herd coming down Yellow Creek. On our third day during an exploration of the more forested side of Yellow Ridge, we found an elk antler and a bighorn sheep horn. 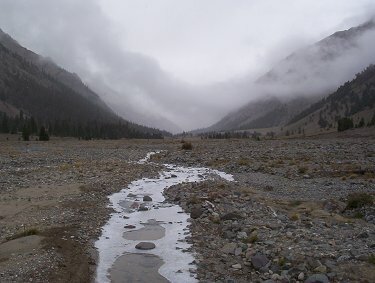 On our fourth day we descended the Greybull in a late summer snow storm and hiked to the upper basin of another tributary for a camp prior to our climb to Burwell Pass the next day.